Even though modern desk phones, especially those that are VoIP compatible by default, have many advanced features, there is one major disadvantage you cannot avoid: they are not portable unless you detach them from the cloud phone system. If you’re continuously on the move within your company’s facilities, you need something with more or less the same features of a desk phones, but with the convenience of portability. This is where cordless phones, also known as handsets, come into the picture. 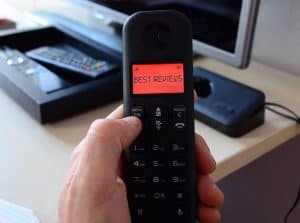 Despite still not being as widespread as VoIP desk phones, cordless phones have many pros with which they easily beat their fixed counterparts. But in which cases should you opt for a desk phone unit or a cordless handset? And which are the best VoIP handsets available on the market? There are some very good reasons why more and more people are buying handsets instead of desk phones. The biggest, and probably the most obvious advantage is that you can move quite far away from the receiver without being bothered by phone cords. Furthermore, thanks to dual handsets, you can have two or more cordless phones linked to the same docking station, meaning you can place handsets anywhere to easily pick up calls when needed. You can also have it double as a neat little intercom system (which can even serve as baby monitors). Last but not least, the most up-to-date handsets come with advanced features like picture caller-IDs, contacts syncing, a headset jack and HD voice. However, since handsets communicate via radio waves, there is a huge chance of interference caused by other cordless devices. Unlike smartphones, you have to stay within a certain range from the docking station. And most importantly, there is the power issue: not only do handsets require batteries to operate, but if there is a power outage, their docking stations are out of the game. Before you decide whether you want a handset or a desk phone, take into consideration your preferences and the intended use of your VoIP system. If you are stationed at the same space for longer periods of time, or you are an attendant/system operator, you need a desk phone. Desk phones can handle multiple lines and extensions at the same time (even via expansion modules) and they have hard keys with which you can give commands related to calls and voicemails. Furthermore, they possess larger screens and they cost less than their cordless counterparts. However, if you often move around within your place of work, you should get a handset. Cordless devices might cost more and have smaller screens, but both the handset and their docking station are more portable. They also have more convenient, mobile-like menus for further call handling and system management purposes so the devices can be lighter (since they only have the most necessary hard keys). And like we said before, there are cordless sets with which you can use multiple handsets with the same docking station, meaning better mobility. Like in the case of desk phones and ATAs you can buy pre-configured cordless VoIP phones (or to be more precise, mobile sets) from many cloud phone system providers. Furthermore, many companies even provide you the option to not buy, but rent the phones for a monthly rental fee. When you browse the cordless phone supply with your VoIP provider itself, you will notice something: not only you can choose from a smaller amount of phones (mostly those of Yealink, Panasonic and VTech), but they can be insanely expensive compared to more advanced desk phones. Therefore, the best option to score a better deal is to purchase your handsets somewhere else, like in consumer electronics stores or in online shops like Amazon – even though it means you need to configure your phones with your VoIP system yourself. Aside from only being compatible with the Ooma Telo adapter, the Ooma HD2 handset is a brutal powerhouse. It not only provides HD voice without any external interference and a 2” screen capable of displaying picture caller IDs, but it can also sync all your contacts with Google, Outlook and Facebook, and make them fully searchable. Aside from that you get speed dials, call logs with instant redial option, paging and intercom between devices connected to the network, one-touch voicemail retrieval and a headset jack for truly hand-free conversations. Even though Ooma HD2 can be purchased separately or with Ooma Telo from the manufacturer, Amazon offers it for way better prices: the handset is $45.95, while a complete Ooma set is $99.99. 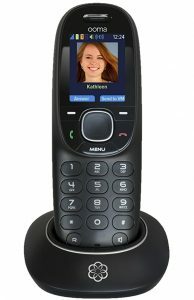 We are letting the cat out of the bag in advance: the Philips VoIP 080 phone has a USB-jack, meaning it can only be used as a softphone extension. However, as a physical extension it is a pretty clever solution: you can place and receive calls via your computer while having the convenience of doing so via a device that resembles an actual cordless desk phone. Furthermore, the Philips 080 perfectly integrates with Skype, which you can access with a touch of the designated Skype hard key. Attention: the phone is intended to be used with Windows XP only, using it with other operating systems might result in compatibility issues. 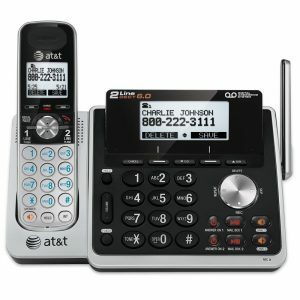 AT&T’s handset solution is unique because it unites the convenience of cordless phones with the powerhouse a regular VoIP desk phone can be. Both the TL88102 and the 88002 use the DECT 6.0 digital technology and can store 50 names, 10 of which can be put on speed dial. They also have voicemail indicators, provide remote access to your voicemail boxes and you can retrieve your messages from the handsets themselves. Both devices can be used for intercom and conferencing purposes. In the latter case, you can conference between an outside line and up to 4 cordless devices. However, the biggest difference is that TL88002 is only a complementary of the TL88102, the base unit. In fact, the base unit is a clever mix between a cordless phone and a desk phone, since it has a built-in answering machine and a 2.5mm headset jack. Furthermore, the TL88102 is capable of housing two lines and up to 12 TL88002 complementary handsets at the same time. With Amazon the TL88102 is $102.60, a complementary TL88002 is $29.93, while a bundle with 3 additional handsets is $179.98.